'Gorgeously quirky' Stylist 'Evocative and humorous' Observer 'Beguiling' Guardian It's been a tough day. She's been dumped. Twice. She's accidentally killed a goose. And now she's suddenly responsible for her best friend's deaf-mute son. But when a shared lottery ticket turns the oddly matched pair into the richest people in Iceland, she and the boy find themselves on a road trip across the country. 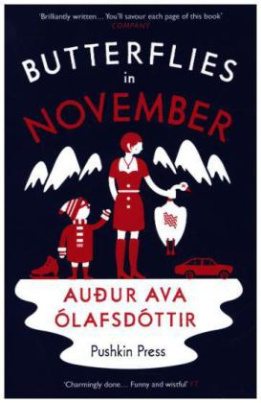 With cucumber hotels, dead sheep, and any number of her exes on their tail, Butterflies in November is a blackly comic and uniquely moving tale of motherhood, friendship and the power of words.